The White Rim Trail; only up to Musselman Arch. Here is the third installment of the Shafer Trail adventure; the White Rim Trail. Unfortunately, because of the incoming storm, we were only able to get a few miles past Musselman Arch before the lightning began its show, and rain drops began to lightly fall. Getting caught in a flash flood, or being stuck on the trail due to a wash out was definitely NOT on our to-do list, so we hightailed it back to the junction. During the monsoon season, (mid July to late September), part of the White Rim Trail had been closed down due to severe damage caused by flash flooding; we drove along that section, that had been reopened, and a good chuck of missing edge had narrowed the road. If you want to do the White Rim Trail, don't even think of trying to take a 2 wheel drive vehicle (passenger car); 4 wheel drive, dirt bikes, hiking or mountain biking is it. 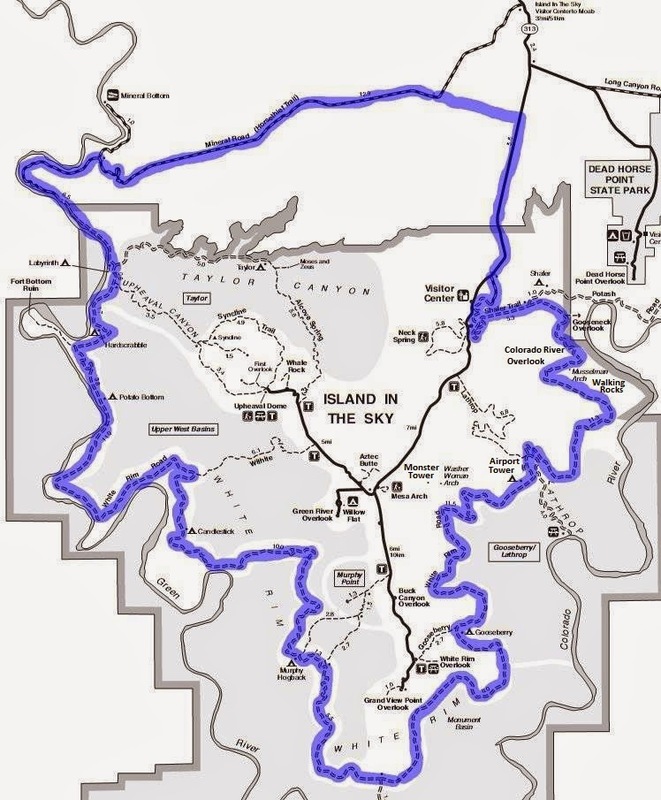 The Trail is approximately 100 miles and will take 2-3 days via 4 wheel drive to complete; click HERE for the National Park Service site and information. In other words, this is not a quick stroll in the park, so plan accordingly. We were hoping to reach Washer Woman Arch/Monster Tower before turning back, but the storm decided to change plans for us. It's all good, only gives us incentive to go back and try it again. Lecture over, lets have an adventure! After a few miles along the trail, we turned around to see where we had come from; yeah, it was a WOW! moment. Like the Shafer Trail, there are many interesting formations which may or may not have specific names; we called one "The Dragon" for that is exactly what it looked like to us. Even though it was in the far distance, we could see Airport Tower. I'm not sure why, but we bypassed the trail to the Gooseneck Overlook; something ahead caught our attention, but cannot remember what exactly. Anyway, as we kept driving, the scenery became more and more outstanding; it is the stuff of dreams! The Colorado River Overlook was our first walking trail stop; it is not a far walk, less than a quarter of a mile, and the view...oh my, the view! We passed by two massive buttes before finally reaching one of our goals, Musselman Arch. Formerly known as "Little Bridge", and you'll see mention of Little Bridge Canyon on the map, it was renamed after Moab local, Ross A. Musselman, explorer, rock shop owner, developer of the Pack Creek Ranch. National Geographer writer, Jack Breed, renamed the arch/bridge after Musselman in recognition of all the help he had given the writer. Musselman Arch is 5 feet thick, six feet wide, 187 feet in length, and it's 300 feet down to the canyon floor below. Did we walk across this bridge...that's a big HELL YEAH!!! The trick is to just do it, don't hesitate and especially, don't look down. Mountain bikes are NOT allowed across; walking only. Mary walking over Musselman Arch. Roy walking over Musselman Arch. ...and at one end of Musselman Arch, Walking Rocks are easily seen; upside down legs, feet skyward, walking the air. As I wrote at the beginning, we'd only gone a few miles towards Lathrop Canyon before the weather made us turn around and go back. That means we didn't have a chance to stop at the Gooseneck Overlook either, but hey, it's back on our to-do list with Washer Woman Arch and Monster Tower. Once back to the junction, that's when we did the Shafer Trail to Potash Road. It was amazing, all of it was amazing; we're looking forward to going back and doing more! After reaching the junction of Shafer Trail/Potash Road or the White Rim Trail; we did continue onto the White Rim Trail, but I'm going to post about that in Part Three of this write up. For now, lets just pretend that we made that left turn and decided to head on out to Moab; we're still in San Juan County and, technically, would not enter Grand County until we passed by the potash collection pools. Almost immediately we entered into what we decided to call "Valley of the Hammers", as that is what the formations reminded us of. At any moment, we expected to see armored dwarves from Mithral Hall (R.A. Salvador reference); from Lord of the Rings fame; or even Thor himself carrying Mjolnir. Shafer Canyon certainly presented us with pleasant surprises! One sign you will see is about the Bighorn Sheep Lambing Area; unfortunately we didn't see any of these majestic creatures walking the ground areas, or among the rocky ledges. We did, however, see the Colorado River and the famous "gooseneck" that lies below Dead Horse Point. By the way, one of these shots is supposed to be of "Thelma and Louise Point", but I can't figure out which one. Shafer Canyon has a lot more interesting rock formations besides what we called "Valley of the Hammers"; I found not one map nor site that gave names to them, but that's not unusual. There are so many formations throughout the area, that giving each one a name, well who could keep track!?! Here's where the road gets a bit interesting, it's one of those riverbeds that we didn't just cross, but had to drive through for a bit before we came to an actual road again. A couple of times I had to get out, scout out a more level driving area, and direct Roy over it. Now that storm coming in from the south and west I mentioned in Part One; somehow we kept just missing it; in other words, we didn't get rained on, but saw an amazing lightning show in the distance. I can never seem to get those lightning shots timed exactly though, so no photos of the show, just memories. There were more formations of course, the most prominent being "Chimney Rock"; couldn't help but take shots of it as we got closer and closer. Yes, another formation called "Chimney Rock", but this time in San Juan County, Utah. We did find an information board at one point which explained about the Shafer Trail, Bighorn Sheep and various dos and don'ts. Too bad those people we had seen driving cars up from Potash Road didn't stop and bother to read it. Don't be fooled though, there are still several miles to go before you see pavement again; this ride is not over yet! The potash collection pools are not too far away; once you get past them, you'll enter into Grand County. Still a ways to go yet till you reach Potash Road itself; there will be various trails to the left and right, but "no trespassing" signs will keep you going in the correct direction. Now Arches National Park has its "Balanced Rock" and so does the Shafer Trail; across from it, a small cave can be seen within the wall. Once you see these rock formations, you're almost to Potash Road; ahead will be the boat basin and immediately the paved road. Don't be too keen to get off Potash Road quickly; you don't want to miss out seeing Jug Handle Arch, Wall Street (a mecca for "crack" climbers) and several areas of rock art. We surely lucked out this day; the storm that had gone through dumped enough water onto the cliffs to form a waterfall. We did it! We drove the Shafer Trail! Now this was a special day for us, not just because we drove the trail, but we were celebrating our anniversary too. We treated ourselves to a most awesome dinner of prime rib and baked sweet potato at The Cowboy Grill at Red Cliffs Lodge; the view from our table did not disappoint. Part Three will be the next installment of this most excellent adventure...the White Rim Trail. Chaco Culture National Historical Park.